The older I grow, the more I find pleasure in seeking out the unknown, the insignificant and the less celebrated. Maybe its part of my human DNA. That undeniable thrill of rooting for the underdog and sticking it upto the man. I found this particularly to be the case when choosing destinations to visit and write about this year on the BudgetTraveller like Leipzig, South West France and Aarhus. I did go back to Barcelona this year. When I see angry signs everywhere saying ‘Tourists Out and F*** Off’ hanging from locals balconies and also the simple act of getting from A to B becoming a huge ordeal, something that wasn’t the case even 5 years ago, I start to worry. I find myself increasingly drawn towards visiting offbeat places where people welcome you, where your money can make a difference and also where your mind and body can rest: a true holiday. I spend hours on end during this darker days of Autumn, looking at the vast empty swathes of green and unheralded little towns on my world map, the distant fringes of our uncharted universe where few dare to venture. What would it be like to go there and there….? It is definitely one of the reasons I fell in love with Scotland. The fact that you can walk for miles without encountering a human, let alone a selfie stick. 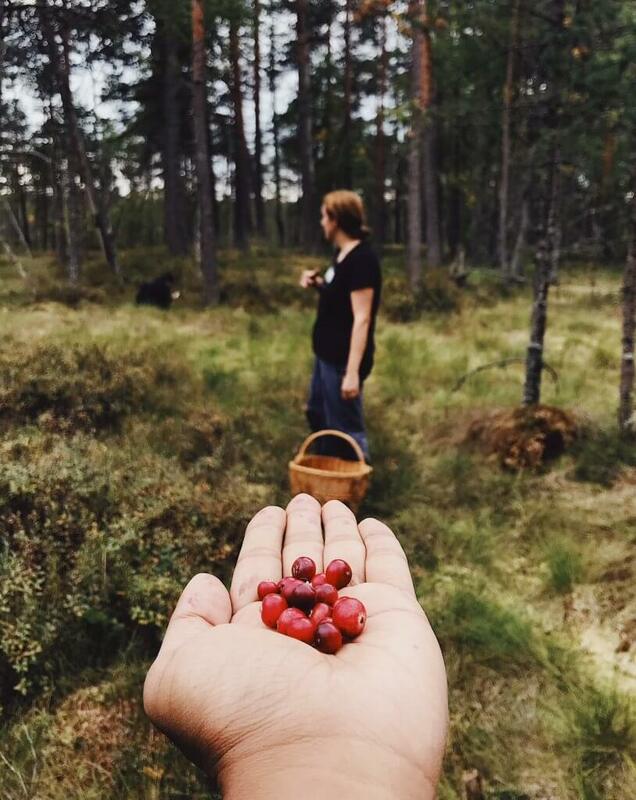 It is precisely that desire of seeking the unknown that led me to Latvia this autumn. A flat green landscape, half the size of Greece, filled with a myriad of beaches, rivers, lakes, marshes and so many forests. The odd town and human thrown in every once in awhile for good measure. Crazy, when you think of it. The capital Riga has 700,000 people and when you get to the 2nd city, Daugavpils, the population shrinks to 80,000. It is quite a bewildering, sad sight to see the trend of depopulation across Latvia and the rest of the Baltic states. Latvia, with a current population of 1.96 million has lost close to a quarter of its population since the Soviet seceded control in 1991, a trend that continues to this day. 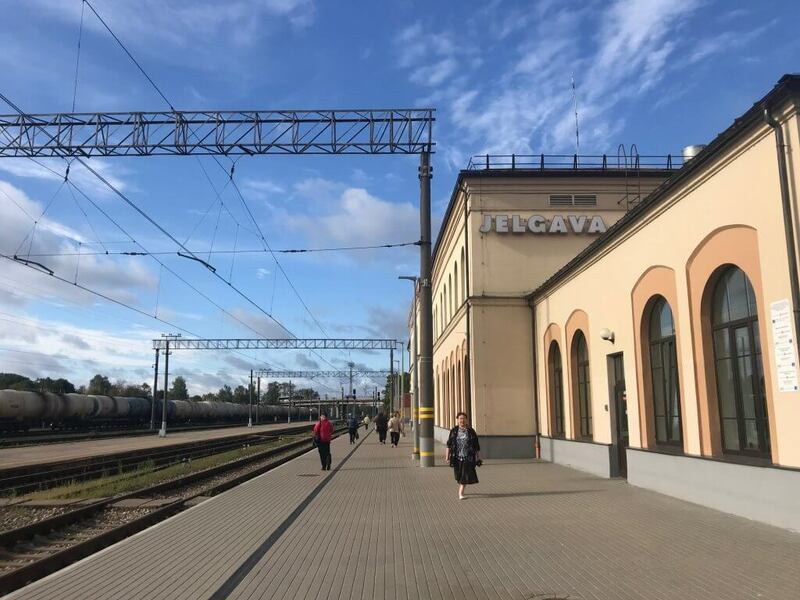 Which brings me to Jelgava, Latvia’s 5th largest city, 41 kilometres southwest of Riga. 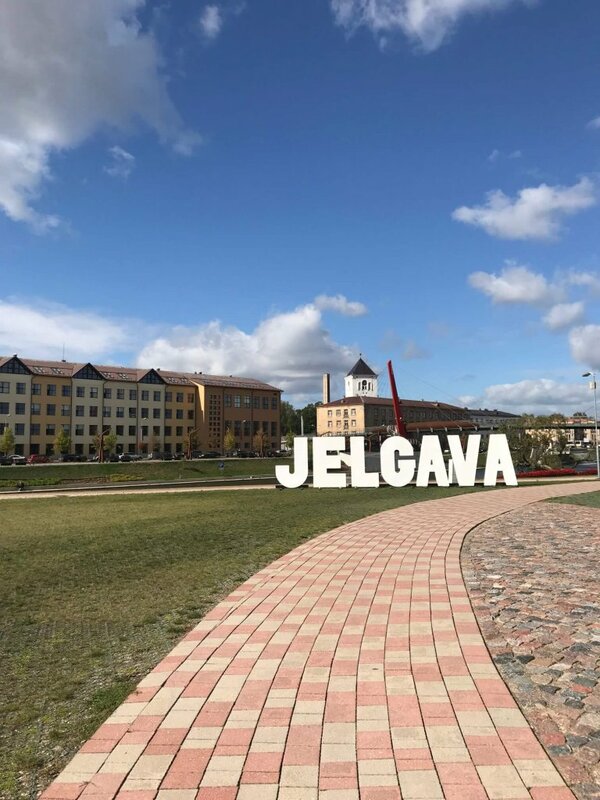 With a population of 56,000, Jelgava is today a city of culture, education and lots of young people thanks to its thriving university. The city was founded in 1265 by the Livonian Order, a group of people native to Latvia that originated in the north of the country’s Kurzeme peninsula. Under their stewardship the city’s prosperity grew and reached its zenith in the 16th century under the rule of the Duchy of Courland who had expanded his empire as far afield as Zambia and Tobago. The riches of the vast empire resulted in beautiful mansions and churches being built across Jelgava. The city’s beauty was apparently equal to that of Riga. However in 1944, tragedy struck when the city was bombed almost to oblivion. Stalin being Stalin also blew up a few more historical buildings in the city for a scene in a Soviet film about the siege of Leningrad. Beyond the desperately painful history, my trusty guidebook tells me little about Jelgava. I have little clue of what modern Jelgava has to offer to as a tourist. So when I stepped out of the main train station after a 40 minute train ride one fine sunny day in late September, I really was not sure what the day had in store for me. Luckily, I had some help at hand. 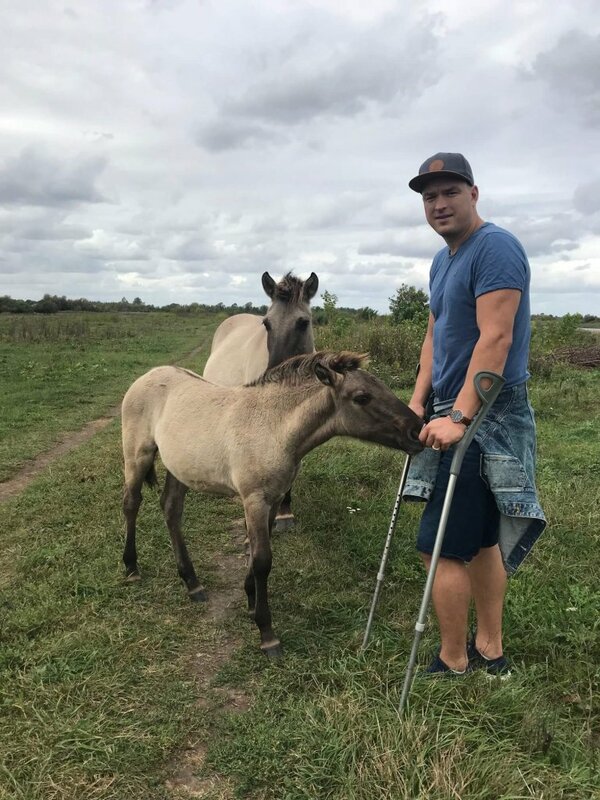 My friend Lelde and trusted authority of all things Latvian had managed to connect me with one of her friends who is also one of Latvia’s leading Instagrammmers: Karlis Buskevics- checkout his Instagram account. Karlis, had sadly sprained his ankle while playing basketball a day before, a sport dear to many Latvians. He was hobbling on crutches so we were going to cover a few of the sights in his car. Let me point out to you now that Jelgava is a very walkable city but hiring a bike, definitely helps. I hop into Karlins plush BMW car and as we pull out of the station, I am greeted by rows of depressingly familiar Soviet style housing that has been a characteristic feature of my trip to Latvia. After criss crossing a few blocks , Karlis pulls in front of a quiet whitewashed block of flats. The ground entrance of the building is a hub of activity with locals flooding into a hip space that looks at odds with its surroundings. We pile in to discover a brightly lit cafe, strong with the smell of caffeine and freshly baked goodness. 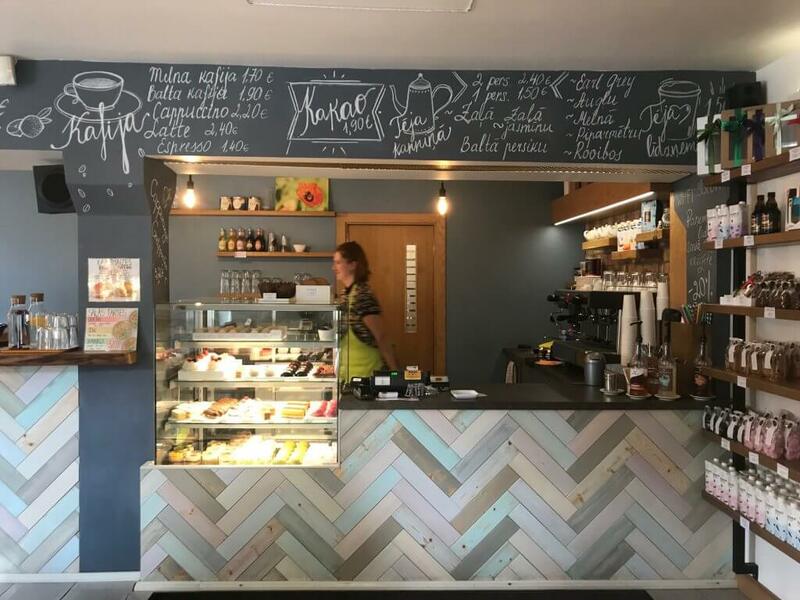 The cafe is called Konditorejas Studija Tarte (Mātera iela 26, Jelgava, LV-3001). The wood and white minimalist interior with a sprinkling of wooden tables and sofas feels very nordic in feel and vibe. It seems to be a popular meeting point for locals: in the 30 minutes we are there, Karlis greets 5-6 friends of his who have also dropped by for their caffeine and sugar fix. Or it just could be that Karlins knows everyone in Jelgava, which later I discovered to be true. I liked the place. 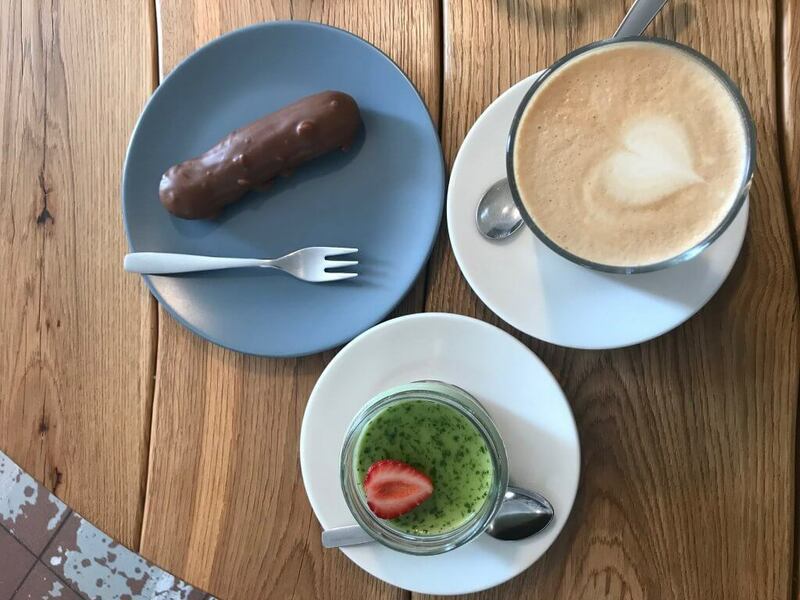 From macarons to mousse to the most delectable chocolate eclairs on earth ( this was a trend in a few cities I visited in Latvia)- there’s way too many delicious treats here to choose from. Me and Karlis pick a few things from the menu and predictably feel sweetly sick like pimply faced kids by the time we leave. To help walk off the sugary goodness, Karlis takes me for a long walk by the winding ‘Lielupe’ aka the ‘Big River’ which meanders through the heart of the city. Its midday and there’s a few young people, most likely students from the nearby university basking in the autumn sunshine on the newly created promenade. 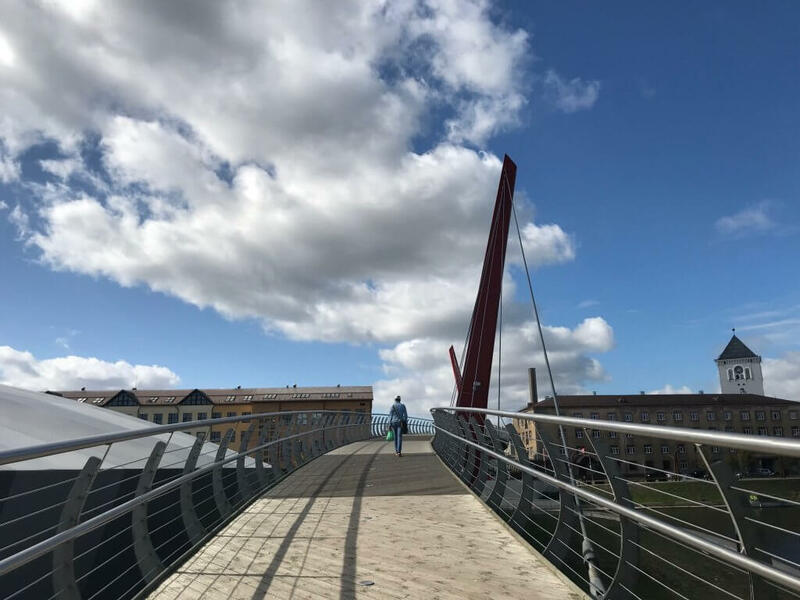 Complete with bike lanes that runs along the river and the odd vintage boat moored on the river, there is a very pleasing and edgy vibe, completed by the unique three-dimensional swan neck bridge that arches over to the small recreational island which they call Pasta Island. I later discover that at 152 metres, this is the longest pedestrian and bicycle bridge in Latvia. More unusual cool facts about Jelgava. After hopping across the bridge to Pasta Island, I start seeing a plethora of giant sized unusual sand sculptures. Turns out that Jelgava is home to the biggest sand sculpture festival in Northern Europe which was coincidentally founded by Karlins uncle 20 years ago. 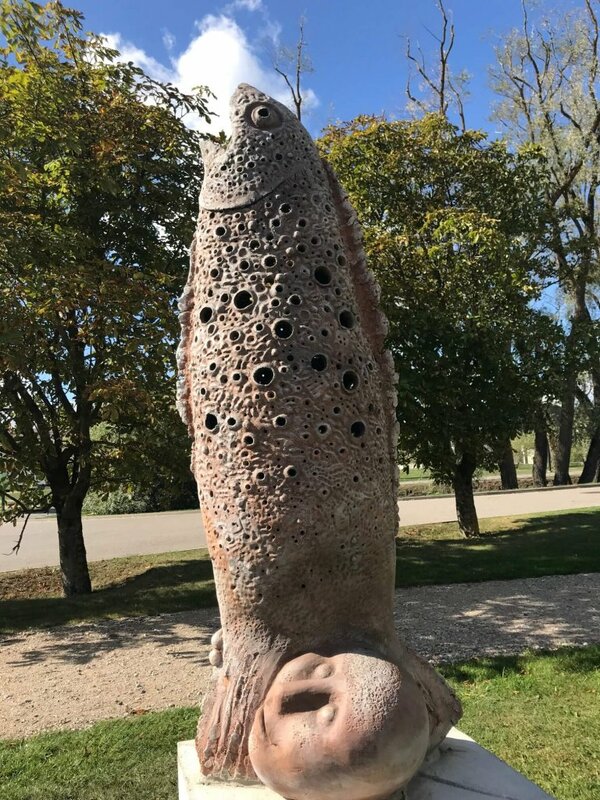 Every summer, recognized sculptors from across the world like Czech Republic, the Netherlands, USA, Russia, Hungary, Italy, Great Britain and of course Latvia gather to create these pieces which widely vary from naive and childish heroes to mythological figures to reproductions of complicated decorative shapes. They have an eye watering 14,000 tonnes of sand at their disposal to create these figures. Talking about standing the test of time, we hop across the bridge to one of the few remaining iconic buildings that wasn’t completely razed to the ground in 1944: The Holy Trinity Tower. Restored in 2010, the tower is the oldest building structure in the city and probably the most iconic structure in the city. Partially rebuilt, the building nowadays functions as a museum where you can learn more the history of Jelgava and the Zemgale region which has been a hotbed for Latvian presidents-in fact, 4 Latvian presidents hail from Zemgale. 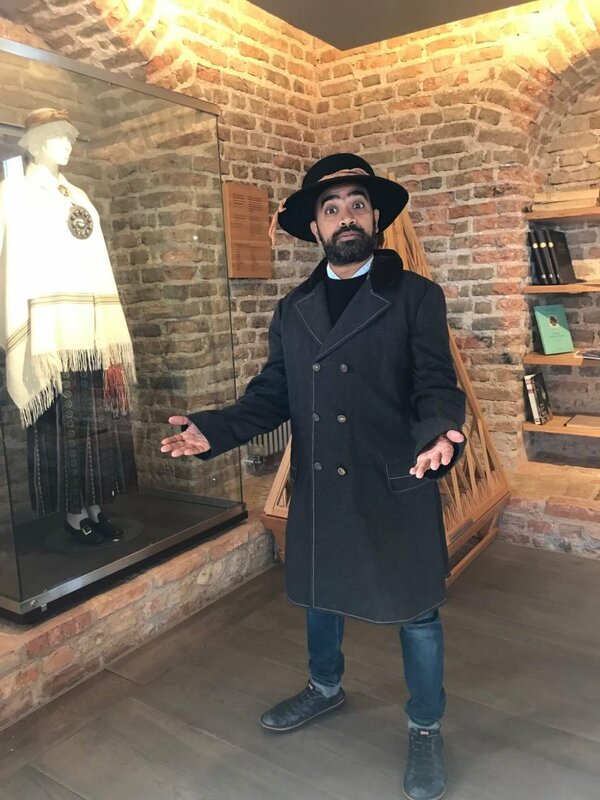 You can get a virtual tour of what the church looked like back in the day and the best fun part is the opportunity to dress up in the local Zemgale costumes and get your picture taken. Nothing beats dressing up like the locals-do you think I could pass off as a Zemgalian? The other notable features of the tower is that it houses a very romantic French restaurant called ‘La Tour de Marie’ from where you can enjoy breathtaking panoramic views of the city while sipping on your Beaujolais or Bordeaux. 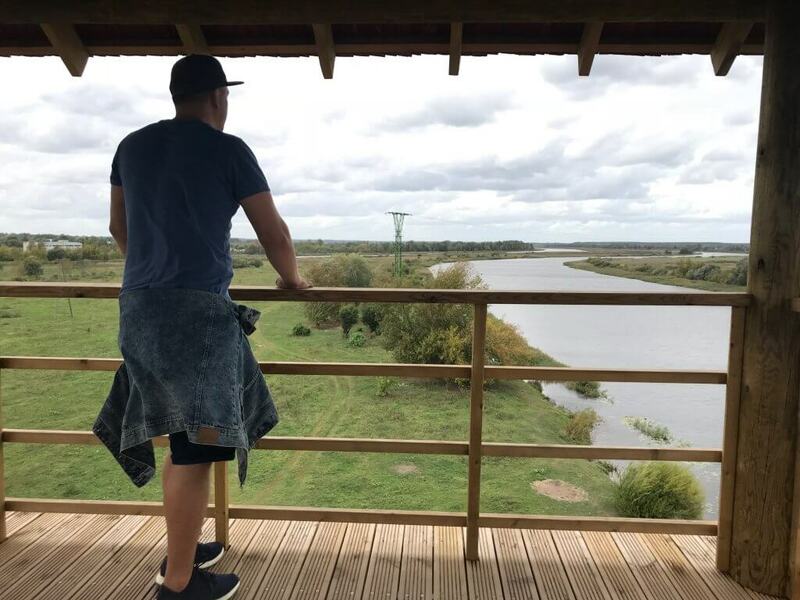 If you don’t have time to sup like me, you can go to the rooftop panorama which gives you a beautiful perspective of the city skyline- a must, if you are visiting Jelgava. It’s barely 11.30am and I ask him if its too early for beer. ‘There’s no fixed time for drinking beer in Jelgava’ he tells me bluntly and I nod approvingly. I would have never associated Latvia with craft beers and beer in general. Even with the harsh cold weather and wide popularity of strong drinks, such as vodka and the traditional Melnais Balzams (Black Balsam), beer is still the number one drink of choice in Latvia and you will be pleasantly surprised at the range and quality of beers available. 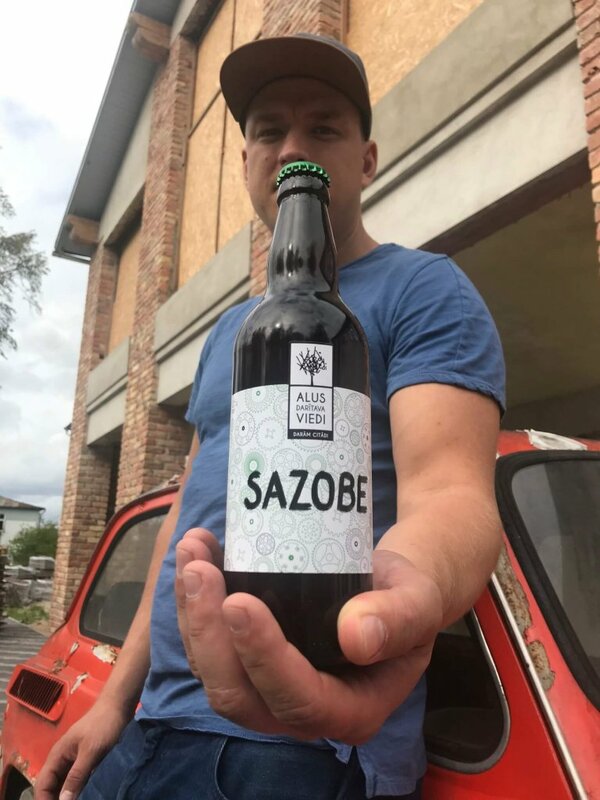 Beer is omnipresent for all social occasions in Latvia, especially during their Jāņi celebration (Summer Solstice) where you will find people sipping on their homemade or craft beer, often enjoyed with their Jāņi sour milk cheese which is specially made for midsummers. I tasted a few of their beers at their small scale brewery tucked away on the edge of the city. I am not much a craft beer connoisseur but I find all of them delicious, especially their blonde. Also the beer is unfiltered and unpasteurized, like many other local beers. I don’t know about you but after drinking 3-4 of these, I struggle! Might becoming a lightweight in old age. Note: The brewery is not open for public visitors at the moment but you can find their beers in all good bars in Riga if you are curious to try them. Feeling a little lightheaded after all that glorious beer, Karlis suggests we go for a wee ride to checkout a few of the city’s remaining iconic buildings that survived the war. 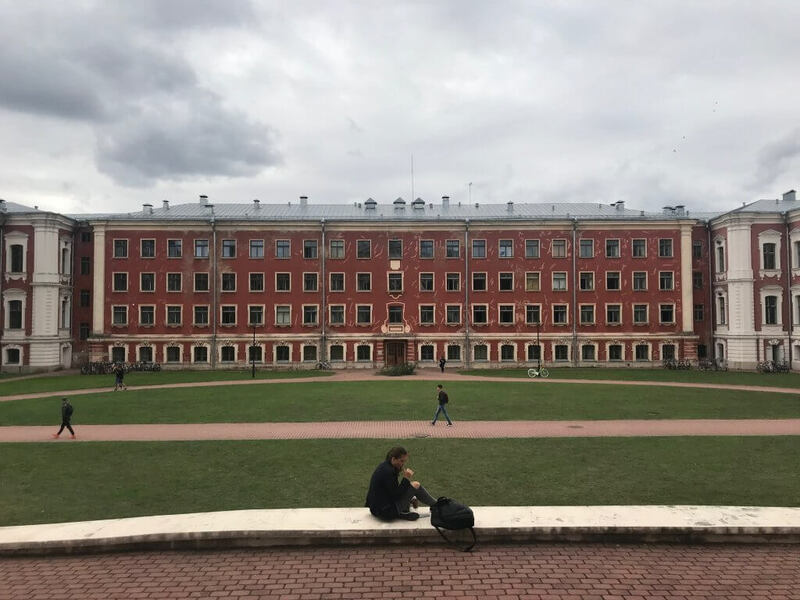 First up , the humongous University of Agriculture and Life Sciences building which is also known as Jelgava Palace. Sitting in a small island in the middle of the ‘Lielupe’, the palace is a bright pink building with 669 rooms which were once home to the fabulously rich Dukes and Duchesses of Courland whom I mentioned earlier. 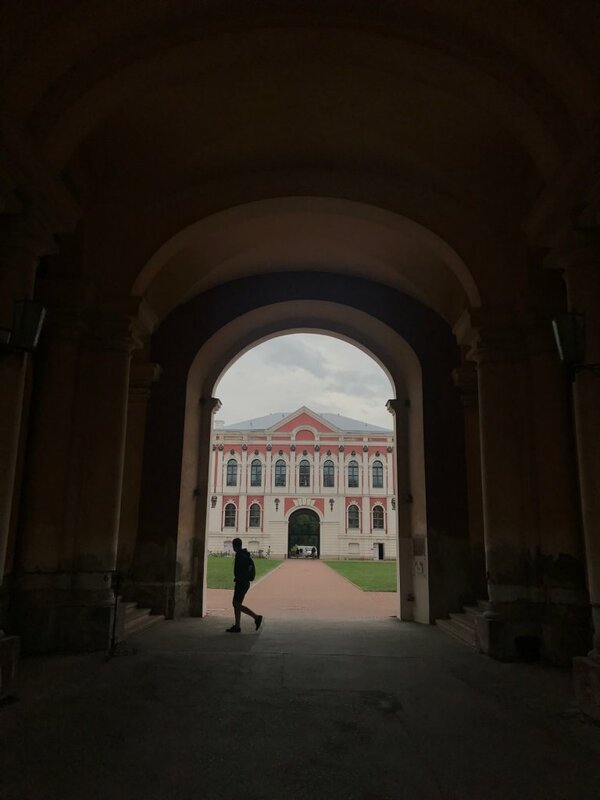 A little bit of history for those of you interested- the palace was built in 1730 by a certain architect named Francesco Bartolomeo Rastrelli who was responsible for building Latvia’s Rundale Palace and Russia’s magnificent Winter Palace. There is a museum inside which I did not visit .The rooms apparently were completed destroyed in the war and since have not been renovated. So what you see is a gloriously beautiful shell with nothing of real note inside which is …a real shame. Karlins also takes me to another beautiful renaissance building of note in the city that similarly had been destroyed inside but still retains a gloriously beautiful exterior. Current owners, both architects have tried to restore the interiors of the building but I’m not quite sure they have done justice to the place. I would encourage to see for yourself and we can later compare notes. 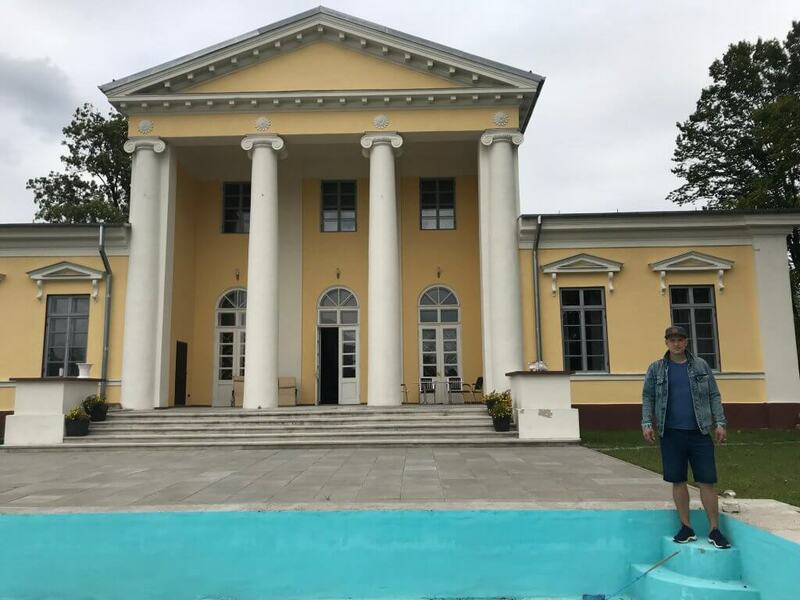 Its called the Villa Medem and has enjoyed a colourful history , serving as a home for the West Russian army, then being turned into a theatre and nightclub in recent years before going into private ownership. The day has flied by and it is almost time for me to head back to the bustling metropolis. Karlis though has one more thing up his sleeve he wants to share with me which he promises will blow my mind. We walk further up the river and soon arrive at this very grassy meadow which is dwarfed by this huge wooden viewing tower. The glorious autumn sunshine has faded away and replaced by dark, ominous looking clouds in the distance. The wind swirls around our feet and shakes the sturdy wooden frame of the tower as we slowly edge our way up three flights of stairs. I stop at the top and finally Karlis reveals to me the secret of this place. In the distance, Karlis points out a small posse of about 10 wild horses grazing just beside the bank. There are apparently 60 of them in total spread across the area. We descend the tower and then enter into the enclosed pen built to keep the horse within safe bounds. I have to admit, I was a bit nervous. I had this image of them hurtling towards me at breakneck speed. The reality though, could not have been much different. Moment we stepped into the field, the whole group of 10 horses, mother and child, slowly walked towards us in the hope we were going to feed them. Which we didn’t. They came upto us and nuzzled our hands and nudged our pockets to suss out if we were hiding any food. After speaking to them in a low soothing voice, I gently stroked their neck and looked into their beautiful black eyes. Was a pretty magical moment. We left them there, the whole group silently staring at us. It was a bittersweet moment. I asked Karlis what was the story behind them. According to him, they had escaped a circus and decided to make this stretch of grassy land, their home. 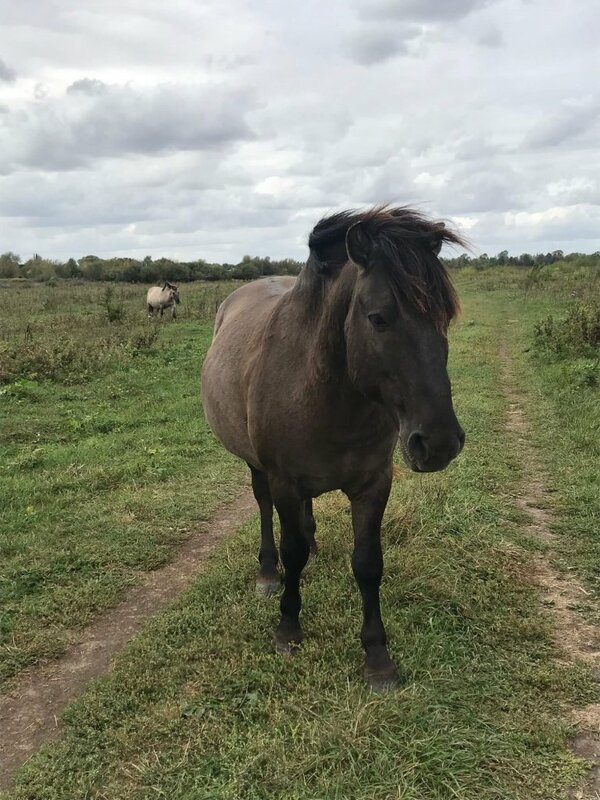 Other story which I cannot confirm is that the horses were brought here to graze and protect the meadows from invasive plant species as part of a project with the European Union and World Wildlife Fund. If you know the truth, please let me know. So. 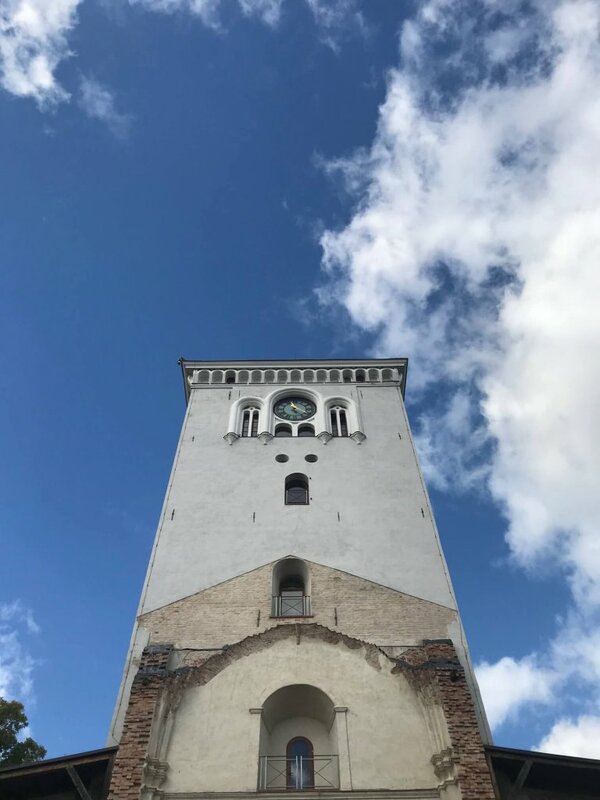 That was Jelgava , a blissfully offbeat destination with pockets of interesting history, great food and beer plus the odd magical surprise. 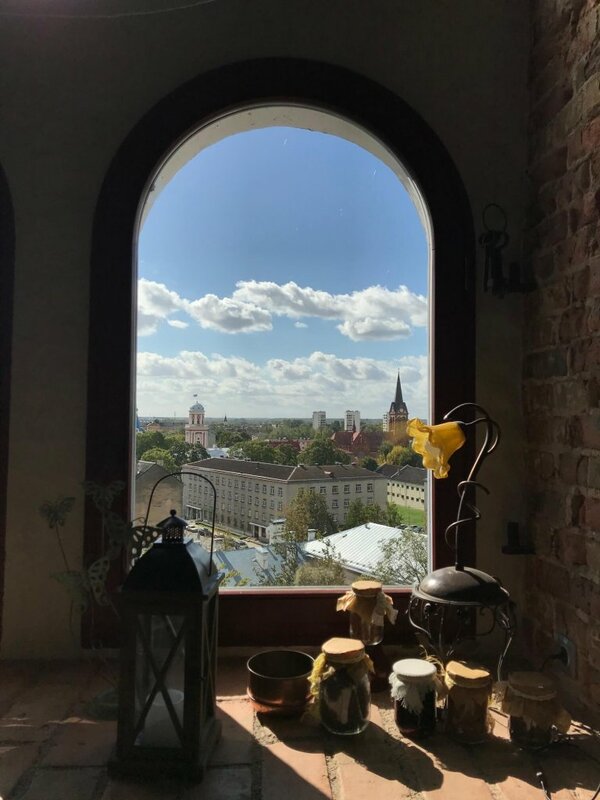 Like Daugavpils, it won’t feature high on many Baltic itineraries but again, if like me , you like to celebrate the less celebrated places, seek the unknown and are looking for a day out with a difference, its definitely worth the trip from Riga. The train journey from Riga to Jelgava takes 45 minutes and costs just €2 each way. 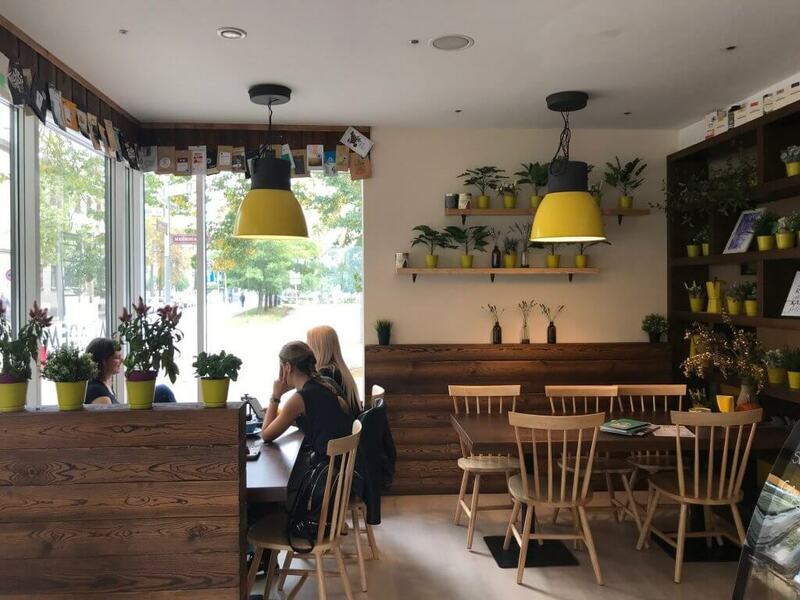 If you’re looking for an affordable and decent place to eat for lunch, checkout Chocolate & Pepper ( Krišjāņa Barona iela 6,) where they have a fixed price menu: €5.70 for 2 courses or €7.90 for three courses. 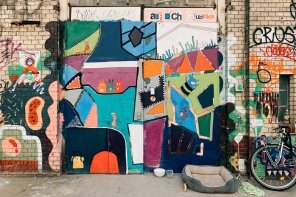 We visited Jelgava as part of a month long storytelling project with Magnetic Latvia (LIAA) While my trip was covered by LIAA, all the opinions expressed here are entirely my own. Paldies to Karlis and Jelgava Tourism Board and Lelde Benke for bringing us to Jelgava-I hope to return soon. 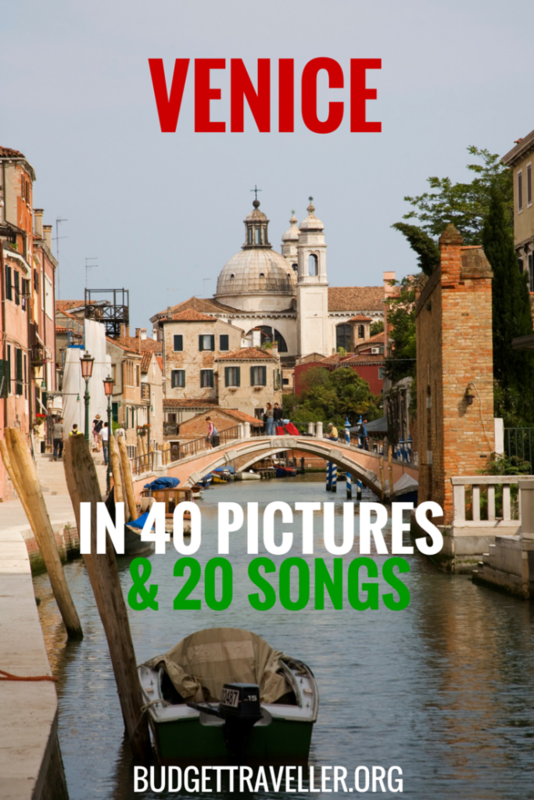 Venice, in 40 pictures & 20 songs.